From the very first Morrow County Fair in 1850, Mount Gilead has held a spot in her heart for harness racing and constructed a fine half-mile track (two times around the oval) in 1868 for their “Speed Program.” Everyone would bring their trotters and pacers to see if they could “outstep” their neighbors’… it became a family tradition. 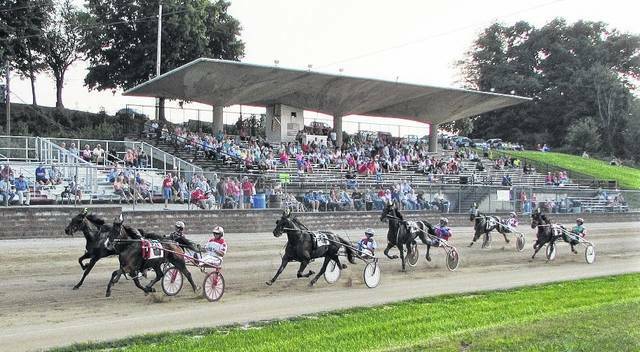 The races start on Monday afternoon, Aug. 28 at 4:30 p.m. as the 2-year-old colt and filly pacers and trotters compete in their respective divisions of the Ohio Fair Racing Conference stake races. The Bill Taylor Memorial, a Free For All Pace, will highlight the program. Tuesday afternoon (Aug. 29) has a 4:30 post time as well and features more Ohio-bred OFRC two and three-year-old trotters and pacers and a Free For All Trot as the area’s “good trottin’ horses” do battle. Come on in, bet your favorites, and cheer on your winners! Just like way back when… because Mount Gilead remembers. The pacers pass the grandstand for the first time as the excitement and action of harness racing is at Morrow County Fair.